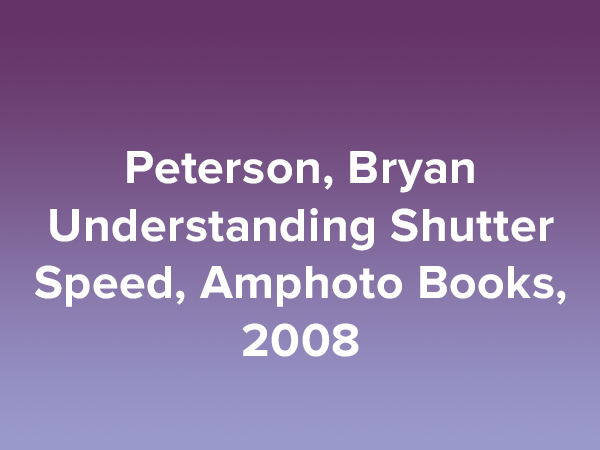 This is another beautifully illustrated book by Bryan Peterson that explains basic photographic concepts, this time about shutter speed, in an easily understandable way. It is the perfect companion to Understanding Exposure and makes a nice complement to that book. The chapters about slower speeds begin with making rain using 1/60 sec. and Peterson’s preference for slower shutter speeds because of the greater opportunity to be creative with them. Panning requires shutter speeds at between 1/30 to ¼ sec. and a colorful background. The cotton candy effect with waterfalls or windblown scenes requires ¼ sec or ½ sec. The really slow shutter speeds of 2 to 8 seconds are good for “painting,” a technique where the photographer deliberately moves the camera to create a painted effect which works particularly well with colored backgrounds. The remainder of the book has tips about zooming, low light and special effects photography. Peterson’s recipe for night photography is to take a meter reading from the sky and use one of the six correct shutter speeds from that reading to shoot the image using the aperture and shutter speed to get the effect you want. “The longer the exposure time, the greater the amount of motion recorded in the image.” To capture lightning a long shutter speed increases the chance of the shutter being open when the lightning occurs. Understanding Shutter Speed is not the breakthrough book that Understanding Exposure was when it was published, but the two books together are a wonderful foundation to build upon your photographic skills.